A purifying papaya body wrap to relax and detox the body while smoothing and softening the skin. Prepare a bath, sun lounge or floor with towels to lie on. Check the room is warm, because the wrap will cool the body. Put the heater on or an old blanket in reach, if need be. 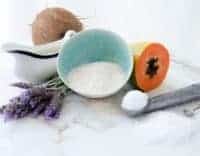 Mix all the ingredients, except for the Epsom salts, in a big bowl. Place 1 cup of the mixture in a separate bowl to use on the face. Stir the Epsom salt into the big bowl of mixture and the body wrap is ready. Take a warm shower to help open the pores, but don’t shave before the wrap. Spread out the bed sheet and sit in the middle. Using your hands, pat the mixture all over your body, starting with your feet and covering up with the bed sheet as you go. Apply the face mask and snuggle up in the sheet. Relax, by focusing on your breathing. Stay there for anywhere from 20 to 60 minutes. When you’re ready, scrape the body wrap onto the sheet and dispose or clean off for another use. I have been known to compost the whole thing, cotton sheet and all. Rinse off under a warm, but not hot shower. Moisturize with something like coconut oi. Drink lots of water and pay attention to how you and your skin feel. It’s a good idea to exfoliate the body every day for three days after, because of the way the enzymes dissolve and dislodge the dead cell walls and toxins. You can repeat this treatment once a week for a month and continue monthly for maintenance.